The Porch - All Things Pearl Jam: PJ Party At DeLuna Fest! PJ Party At DeLuna Fest! If you haven't signed up yet please shoot me an email at pjfan@ymail.com. RSVP not required but helps the planning. What: The Official Wishlist Pearl Jam Fan Party! When: 1pm on Saturday September 22nd 2012. Raffle drawing at 3pm. Who: Everyone is invited! If you can email me with how many people it would be helpful but not required. Donations: If you have some PJ merch you can add to the raffle please email me. Check out what we have already. Donations not required to attend. After Party? : Immediately following Pearl Jam's performance on Friday the 21st at Flounder's Chowder House. Have a drink with some fellow fans while the traffic dies down. Poster: The Party Posters are ready! Check them out here. You can pre order or buy them at the show. I'm willing to ship them home for any donation over $20. Just email me for details. Great news! I am happy to announce that the DeLuna Fest's Wishlist party will be hosted at Crabs We Got 'Em at 1pm on Saturday September 22nd. PJ plays Friday night so this will technically be an after party. I'll apologize to the folks who are following PJ to Atlanta and will not be able to make it. I'm hoping you guys will come hang out at the after party at Flounder's Chowder House immediately following Pearl Jam's performance. 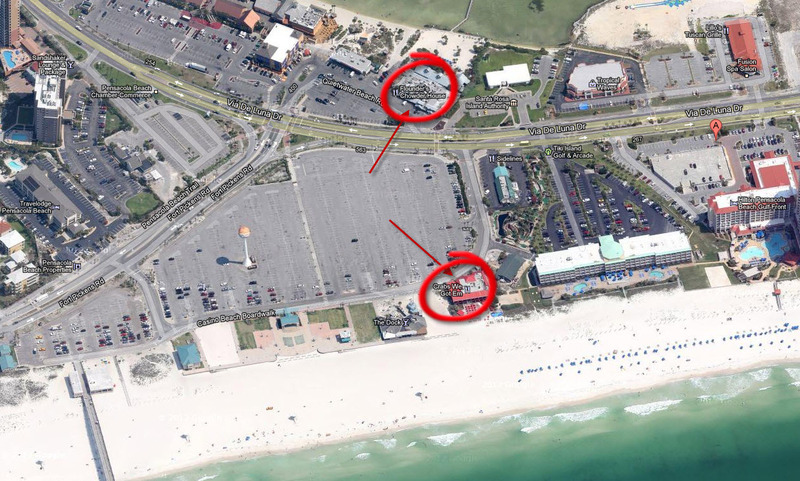 Crabs We Got 'Em is literally on the same beach as the show and is potentially even going to be included as a part of the festival grounds. 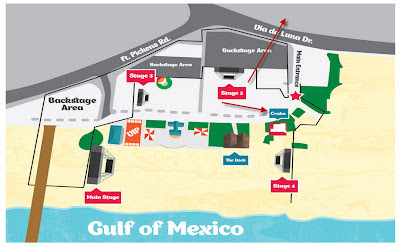 We have the run of the second floor (The Sunset Deck) from which we can even see the stages of the festival. Raffle - We will sell raffle tickets to win prizes like these. T-Shirts and other items available for a donation. Please know that there is zero obligation to donate and there will be no pressure at the party. It's all about having a great time and meeting more of the Pearl Jam family. If you have any Pearl Jam merchandise, used or new, that you can contribute to the raffle, please email me and let me know. Check out what's been donated so far. I'm proud to announce that The Porch has teamed up with The Wishlist Foundation for the Pre Party! I'll be announcing the charity that we will be benefiting shortly but I'm pretty excited to be able to work with a great organization like Wishlist, which is also 100% Pearl Jam Fan operated. What this means for the party is that we'll have raffles and prizes etc. to add to our good times with good people. It's a great opportunity for us to help out a charity in the spirit of the band! It also means I'm on the hunt for raffle items! If you have anything cool you'd like to donate it will certainly be appreciated. Any Pearl Jam merch that you'd be willing to part with or even buy new and donate would be awesome. Needless to say, anything autographed would likely be a huge hit (if you can bring yourself to part with it). If you're able to put anything in the mix please contact me at pjfan@ymail.com to facilitate. Will be announced shortly after DeLuna announces the show schedule. Pearl Jam's second of only three shows in the U.S. this year is in Pensacola Florida and the entire staff of The Porch (yes, that's right, me, myself, and I) will all be there. I'm extremely excited and was hoping to have the chance to meet some of my friends from here on the inter webs. Right now I'm just trying to gather Email addresses of interested people. We already have a small group going and I'd love to grow it. I'll send out an Email as the event gets closer with the where and when and will also update this page. If you're interested, please Email me at pjfan@ymail.com. Or you can always find me on Twitter @ComeToThePorch. If you give me your Email you can rest assured that you will absolutely NEVER be spammed from me, I hate that stuff. If you have ideas for the event I'm all ears as well. Look forward to seeing you! Rock on! 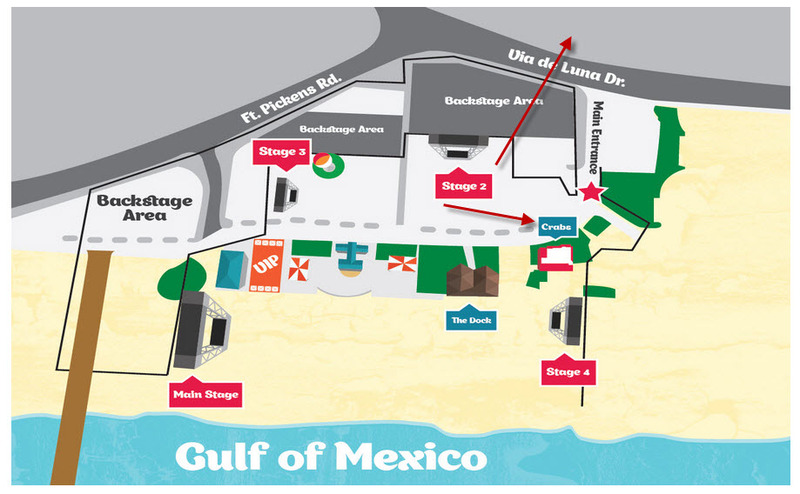 For more details on DeLuna Fest, click here.